Ang tag-ulan kapag ako’y nalulungkot. Na may linis ng pinakamagandang binalaybay. Na simputi ng mahahabang damit ng mga anghel. Ng kasisikat pa lamang na araw. only when I am desolate. whose lines are clean as a poem. with sand as fine and white as the long dresses of angels. were making a beeline for the stands selling churros con chocálate and donuts. Translator’s notes: Simbang gabi (literal trans., “night masses”): in the Philippines, nine-day masses celebrated at dawn, preceding Christmas. Puto Bumbong: a rice cake traditionally prepared at Christmas time, associated with simbang gabi. People coming from the dawn masses buy them to eat from vendors who set up makeshift stands by the church. The rice cakes are steamed in cones or tubes of bamboo over hot coals; they are dusted with a mixture of coconut flakes and sugar, or sugar alone. cobwebs from the windows, and rain washes clean the house’s many eyes. John Iremil E. Teodoro is a Filipino writer, university professor and freelance journalist. He is also a multi-awarded poet and playwright, one of the country’s leading pioneers in gay literature and the most published author in the Karay-a dialect to date. Born to a middle class family in the province of Antique, among Teodoro’s first distinctions were the Literature Grant of the Cultural Center of the Philippines and Gawad Ka Amado in 1993 for his early attempts in Filipino poetry. His first full-length play in Filipino Ang Unang Ulan ng Mayo (The First Rain of May) won 2nd Place in the 1997 Don Carlos Palanca Memorial Awards for Literature. He writes in four languages, English, Filipino, Hiligaynon and Karay-a. He is a member of the Alon Collective and the Tabig/Hubon Manunulat Antique. His poetry book Kung ang Tula ay Pwedeng Pambili ng Lalake (If Poems Could Buy Men) was shortlisted for the 2007 Manila Critics Circle National Book Award. Rebecca T. Añonuevo is a poet and author of five collections of poetry, the latest being Kalahati at Umpisa (UST Publishing House, 2008). Other titles are Saulado (UP Press, 2005), Nakatanim na Granada ang Diyos (UST Publishing House, 2001), Pananahan (Talingdao Publishing House, 1999) and Bago ang Babae (Institute of Women’s Studies, 1996). All collections have won numerous awards for poetry from the Don Carlos Palanca Memorial Awards for Literature. Her study on Philippine literature titled Talinghaga ng Gana: Ang Banal sa mga Piling Tulang Tagalog ng Ika-20 Siglo (UST Publishing House, 2003) won the Gold Medal for Outstanding Dissertation at De La Salle University-Manila and the National Book Award for Literary Criticism from the Manila Critics Circle. She also writes children’s fiction, essays, and reviews. She teaches literature and writing in English, and chairs the Filipino Department at Miriam College in Quezon City. She resides in Pasig City. Luisa A. Igloria (website) is the author of Juan Luan’s Revolver (2009 Ernest Sandeen Prize, University of Notre Dame, Trill & Mordent (WordTech Editions, 2005) and eight other books. Luisa has degrees from the University of the Philippines, Ateneo de Manila University, and the University of Illinois at Chicago, where she was a Fulbright Fellow from 1992-1995. Originally from Baguio City, she teaches on the faculty of Old Dominion University, where she currently directs the MFA Creative Writing Program. She keeps her radar tuned for cool lizard sightings. For years, her grandmother had warned her: They will take your money; you will give them your soul. Now, as she waited for the man, Mathilde’s muscles ached with weariness, and the monotonous tick-tock of the massive mahogany clock raised her tension to the point of panic. Strange designs were drawn on the walls and a hideous sculpture of Jesus hung upside down beside an altar laden with dozens of talismans and potions. On a small table stood grotesque figurines made out of cloth scraps and dots of paint on old wood. “I’m here,” a voice suddenly said. It belonged to a man with an oblong face and mutable eyes. At times, they looked colorless but, more often than not, his pupils took on a golden, almost reddish shade. He wore a big yellow overcoat that contrasted with his dark skin, a gray hat that obscured his forehead, and grimy boots. As he lit the enormous pipe that hung from his mouth, Mathilde’s throat swelled tightly, her heartbeat drowning out the ticking of the clock. She felt slightly numb as apprehension crept over her. I could run, she thought. And yet, she stayed. No one else would help her. All I need is one friend, she thought. Just one friend. One. Mathilde’s feverish hands grabbed her necklace as she thought again about her grandmother’s warning, about stories of houngan and mambos bringing good fortune and healing through their “white” magic. With a shiver, Mathilde positioned herself in the armchair that was the most distant from her host. She saw her reflection in a mirror — her brown hair was dull; her jeans and tee-shirt worn and unclean. No wonder no one wants to be my friend. A furious wind burst the window open and whistled on a threatening note through the foliage of the trees. Mathilde’s lips were dry as she thought about the way the other ninth graders at school laughed at her, sticking “kick me” signs on her back. Once, at lunch time, a girl had poured chocolate milk on her uniform. “I’m new in the neighborhood — and I feel very lonely. I need friends. Jenny has lots of them. You must help me. Please, help me.” One friend, that’s all I need. To laugh and hang out with and talk to and do normal things with. As flashes of electric blue ignited the sky, Maître Octave took off his hat and scanned the room around him with strangely piercing eyes. In a forbidding painting, Baron Samedi, Guardian of the Grave, was portrayed in his traditional garb-top hat, undertaker’s coat, bow tie, cane, and dark glasses with right lens missing. There was no electric switch. Only black wax candles, laid out in every nook and cranny of the room; their flames danced like rubbery snakes in the gloom. The rain moaned and whispered to Mathilde who was engulfed by a disgusting odor. She could not pinpoint the source, but it was both nauseating and familiar. Maître Octave spoke, and for a moment she caught a glimpse of the strange gleam that shined occasionally in his eyes. “Who is Jenny?” he asked. While Jenny was going to parties and school dances, and hanging out with friends, Mathilde stayed home and watched TV. She just didn’t belong. “Does she really have that many friends?” the houngan asked. Maître Octave relit his pipe. Mathilde’s glances kept returning to the sorcerer’s hands. The man was wearing gloves, Mathilde thought, just like a murderer. Her head rang with anguish. She’d sneaked out of the house. Nobody knew where she was. How could one doubt the words of a man with that diabolic glance? It seemed to Mathilde that nothing could resist Maître Octave. “What do you want in return?” she asked. Mathilde’s chest tightened and she struggled to draw a breath. Her right hand reached for her necklace. It was a memento. She had received it from her mother, only a few weeks before the terrible car accident. It was made of brass and copper and shaped like a hexagram with triple acorns. The man stared at her, waiting. How far was she willing to go? The wind opened the window with rage and drops of rain lashed her face. Mathilde jumped at the dull rumbling of the storm. She shivered violently. It’s worth it, she thought. And as she gave him the necklace, she imagined the name-calling that would stop in the hallways. No more ketchup in her book bag. She stood up, careful not to knock the candles over. A wooden bird with a hooked beak stared at her with gloomy eyes. She looked away, but the sculptures were everywhere, scoffing at her. He did not walk Mathilde back to the door but, with each step she took, she felt his eyes on her. “You will hear from me soon,” Maître Octave said. She left the house in a hurry, running in the blinding rain, the wind ripping through her clothes, the earth grabbing her feet. She felt hollow inside. The next day, when she sat in front of her breakfast, it seemed that the ham and eggs were giving out a strange smell… That smell… It was the smell of the morgue when she had been asked to identify her parents the previous year… The smell of the hougan’s house. Mathilde pushed back the plate abruptly, knocking over her glass of milk. She soon realized that her imagination was playing dirty tricks on her. The food was just fine. When the doorbell rang, long and insistent, she hastened to the door. She shuddered when she saw the yellow overcoat, the hat and gray boots. What was he doing here? “Ma’am?” a reedy voice said. She realized that she was staring at a young man. He was wearing a yellow overcoat, but it was not Maître Octave. It was simply a delivery boy. Mathilde signed and grabbed the package. The box was extremely long and rather heavy. The girl had difficulty carrying it into her room. It seemed to her that she could smell that horrible odor again… She was going to open the package when she heard sobs coming from Jenny’s room. Mathilde put the box down and ran to her sister. After a brief hesitation, she entered the room, sat beside Jenny and wrapped comforting arms around her. Surprisingly, Jenny did not push her back. “What’s the matter, Jenny?” Mathilde asked. Horrified, Mathilde thought about the oblong box left on the bed, and also about the horrible smell it was releasing. Mathilde frissonna, lançant un regard anxieux vers la grande horloge en acajou. Le tic-tac monocorde ne faisait qu’accentuer cette sourde angoisse qui l’avait assaillie au moment même où elle avait franchi la grille de la vieille maison. Elle se mit à arpenter la pièce de long en large pour essayer de se calmer. Il y avait cette horrible odeur… Mathilde n’aurait pu dire de quoi il s’agissait. Elle en avait simplement la nausée. Et puis ces curieuses statuettes qu’elle n’osait approcher de trop près… Dans la pénombre, elles semblaient lui lancer quelque défi. Aucun interrupteur électrique. Seule des bougies de cire noire, disposées dans tous les recoins de la pièce, dansaient dans le clair-obscur. « Je suis là, » fit soudain une voix qui fit sursauter Mathilde. Il lui sembla un moment que les battements accélérés de son cœur couvraient de loin le tic-tac de l’horloge. Elle ne l’avait pas entendu arriver et Maître Octave, décidément, était loin de lui plaire. Le visage oblong, les pupilles d’une couleur indéfinissable… Par instants, ils semblaient gris mais le plus souvent, les yeux de l’homme prenaient une teinte dorée, presque rouge. La jeune fille eut un mouvement de recul lorsqu’il s’approcha d’elle. Il portait un énorme pardessus de plastique jaune qui contrastait avec sa peau d’ébène. Un chapeau gris et des bottes de la même couleur complétaient sa tenue. Il alluma l’énorme pipe qui pendait à sa bouche puis tendit la main à Mathilde sans prendre la peine d’enlever ses gants. Après avoir hésité, Mathilde lui tendit la sienne, réprimant tant bien que mal son envie de s’enfuir. Ce n’était guère le moment de reculer. Il lui fallait aller jusqu’au bout. Mathilde se rongeait nerveusement les ongles. Agée de dix-sept ans, elle n’était pas jolie. Loin de là! Ses cheveux bruns étaient ternes, son teint fade, son nez un peu trop retroussé. De plus, Mathilde ne semblait accorder aucune importance à sa tenue vestimentaire. Son jean et son T-shirt, tous deux élimés, étaient d’une propreté fort douteuse. Maître Octave hocha la tête. Un vent furieux entrait par la fenêtre ouverte. Il sifflait dans le feuillage des arbres sur une note menaçante. Maître Octave ne répondit pas tout de suite. Il enleva son chapeau qu’il se mit à caresser du bout des doigts. Il promenait autour de lui son regard perçant lorsque l’orage éclata. Des éclairs d’un bleu électrique zébraient le ciel. La pluie semblait déchaînée. Une véritable rafale. Maître Octave ferma les fenêtres. Lorsqu’il prit place sur son canapé, sa voix n’était plus qu’un désagréable murmure. Mathilde dut se pencher en avant pour entendre ses paroles. Elle crut entrevoir cette étrange lueur qui brillait par moments dans ses yeux. La pluie frappait violemment contre les carreaux de la fenêtre. Fuis cet homme! Fuis cet homme! semblait-elle crier. Maître Octave ralluma sa pipe. Le regard de Mathilde revenait sans cesse aux mains du sorcier. Elle tremblait de peur. Des gants… Pourquoi des gants? Cela lui faisait penser à un meurtrier. Et si quelque chose lui arrivait? Personne ne savait où elle était, ni ce qu’elle faisait. La tête de Mathilde bourdonnait. Une terrible angoisse la tenaillait. La pluie était loin de s’être calmée. Fuis cet homme! Fuis cet homme! sifflait-elle. Maître Octave avait recommencé à sourire. Ses yeux étaient presque tout à fait rouges. Comment pourrait-on douter des paroles de cet homme au regard diabolique? Il semblait à Mathilde que rien ne pouvait résister à Maître Octave. « Comment devrais-je payer? » demande-t-elle. « Ne vous en faites pas pour l’instant, » dit-il. Elle se sentit soulagée. Elle se demandait de quelle manière Maître Octave allait s’y prendre pour lui procurer ce bonheur tant convoité lorsque le vent ouvrit la fenêtre avec rage. Fuis cet homme! Fuis cet homme! Elle sursauta au grondement sourd de l’orage. Encore cette étrange lueur dans son regard. Mathilde tressaillit. Une statuette représentant un oiseau au bec crochu paraissait la fixer de ses horribles yeux jaunes. La jeune fille détourna le regard, mais les sculptures étaient partout autour d’elle. Toutes semblaient la narguer. Au petit jour, une peur inexpliquée assaillit Mathilde et quand elle s’installa devant son petit déjeuner, on aurait dit… On aurait dit qu’une étrange odeur émanait des œufs au jambon. Cette odeur… L’odeur que dégageait la morgue de l’hôpital général lorsqu’elle avait dû aller identifier ses parents l’année dernière… L’odeur du vestibule de la maison du sorcier. Mathilde repoussa l’assiette d’un geste brusque, renversant son verre de lait. Au même moment, la sonnette de la porte d’entrée retentit. Mathilde tressaillit en découvrant le visiteur. Un pardessus de plastique jaune… Un chapeau et des bottes grises… Elle claqua la porte avec un petit cri et se laissa glisser le long du mur. Que venait-il faire ici? La sonnerie retentit de nouveau, longue et insistante. Puis la jeune fille vit avec horreur que l’homme tournait la poignée de la porte. « Je suis pressé, mademoiselle, » fit une voix fluette. Mathilde dévisagea le garçon qui venait d’entrer. Il portait un pardessus jaune, mais ce n’était pas Maître Octave. Il s’agissait simplement d’un garçon-livreur. Le garçon lui tendit une enveloppe qu’elle déchira précipitamment. Elle en sortit un petit bout de papier sur lequel se lisait une écriture méticuleuse: Très chère Mathilde, votre vœu est désormais réalité. Vous possédez un dixième des amis de votre cousine Serena Bicho. « Je suis pressé, mademoiselle, » fit de nouveau le garçon-livreur. Lorsque Mathilde leva les yeux vers lui, elle se rendit compte qu’il tenait une énorme boîte dans les bras. Curieuse, elle signa et s’empara du lourd paquet. Elle eut quelques difficultés à la transporter jusqu’à sa chambre. Il lui semblait de nouveau prendre l’horrible odeur… Elle allait ouvrir le paquet lorsque des sanglots lui parvinrent de la chambre de Serena. Mathilde déposa la boîte et courut à la pièce voisine. Elle n’avait jamais vu Serena dans un état pareil. De grosses larmes coulaient sur son visage rouge. « Que se passe-t-il, Serena? » lui demanda-t-elle. Elle ne répondit pas tout de suite. Mathilde dut beaucoup insister. Une expression horrifiée que Serena, aveuglée par les larmes, ne remarqua pas, se peignit sur le visage de Mathilde. La jeune fille pensait à la boîte oblongue posée sur le lit, et à l’horrible odeur qui s’en dégageait. I first started working as a translator when I moved from Port-au-Prince, Haiti, to Miami, Florida, in 2002. At twenty-one, I was fluent in four languages and, as a full time student pursuing a Bachelor’s degree in Education, I needed the extra cash. Once or twice a week, after my field experience hours in some of Miami’s toughest public schools, I offered my services at lawyers and car insurance offices, interpreting in French, Haitian Creole, and English. At home, once my college assignments completed, I spent tedious hours translating audio files from the Broward County Police Department, listening to suspects claiming their innocence in child sexual abuses cases. The file usually ended with these men breaking down and confessing their vicious crimes. After a while, I grew weary of the macabre aspect of the job and considered quitting translation altogether. That is, until I got the opportunity to translate a few literary pieces. As a writer myself, I enjoyed the task of carefully rendering the meaning of intricate stories. I decided to revisit L’Homme au Pardessus Jaune, one of my short stories, which had been workshopped and edited while I was still living in Port-au-Prince. My translation would be addressed to an American audience. During the translation, my writer’s instincts kicked in and The Man in Yellow Coat took a life of its own, primarily because it aimed at entertaining a different audience. Reader’s Openness to the Supernatural. Take the first line of the story, for instance. In Haiti, the supernatural is always lurking in the back of people’s minds and the intent of a fantastical story easily grasped. Because life in Haiti is laced with mystery and superstitions, only a few words were needed to draw the Haitian audience into the magic world of Maître Octave in the original piece. In the English version of the story, however, I felt the need to add the grandmother’s warning in order to help with the set-up and cater to the American audience, which is more matter-of-fact and doesn’t expect the supernatural, unless hints are given in that direction. P.O.V. Audience also affected the point of view of the narration. While the omniscient P.O.V is admissible in Haiti, a country known for its oral tradition, it was frowned upon in American literature. For this reason, omniscience wasn’t used in the English version. I opted, for instance, to use the old mirror trick to introduce Lily’s physical appearance (Third person attached). Specific Details. A different audience justifies other choices throughout the translation. Some of the details have been changed. An example: While the gloves are mentioned right away in the French version because it is peculiar to wear gloves in Haiti, they are only mentioned later in the English version. Also, to help build on the urgency of Lily’s request, examples of bullying were added in The Man in Yellow Coat. Characterization. In the French version, the other female character is Lily’s cousin. Her name is Serena, which I found suited a character who was idolized and envied. In the English version, Serena became Lily’s sister Jenny. Because she’s meaner in that version (there are actual images of the bullying of Lily), I felt that somehow the name Serena was no longer fitting. The fact that Jenny is Lily’s sister makes her behavior even more despicable. As for the character of Maître Octave, just because he is a sorcerer, he’s automatically seen as evil by a Haitian audience. In the American version, though, I decided that Maître Octave would not accept money, but something much more valuable to Lily, which helps set him up as even nastier character once we reach the denouement and learn of the request’s outcome. I’ve enjoyed the translation of L’Homme au Pardessus Jaune tremendously, particularly because of the liberties I was able to take. I’ve never had one of my own stories translated by someone else. I would be very interested to see what the final product would look like. Born in Port-au-Prince, M.J. Fievre (website) is an expat whose short stories and poems have appeared in numerous publications, including Haiti Noir (Akashic Books), The Southeast Review, The Caribbean Writer and The Mom Egg. She is currently a regular contributor for The Nervous Breakdown and a graduate student in the Creative Writing program at Florida International University. She loves coconut shrimp, piña coladas, her dog Wiskee, and a good story. Anton Chekhov is one of her favorite writers. In my travels in Guatemala and the Mexican states of Yucatan, Tabasco, and Chiapas, while visiting the Mayan ruins I have been struck by the silent omnipresence of glyphs. These ghosts are reminders of a once vast and now seemingly vanished civilization, and yet there are Mayans living everywhere in the region. And in many places the culture is so strongly preserved and felt that it is like a nation (many nations really) within a nation. 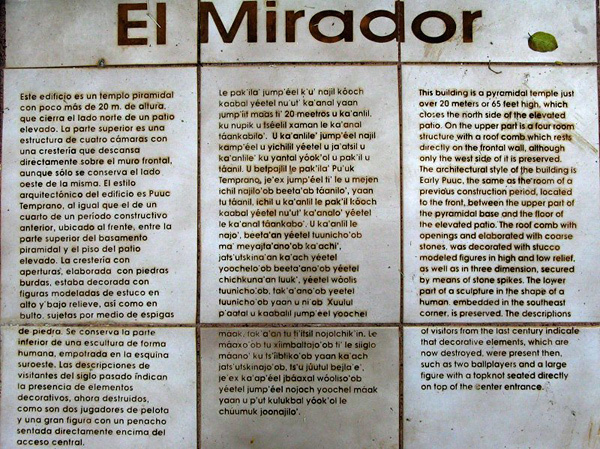 The guidebooks tell you that in some villages Spanish is not the predominant spoken language. It is a living and highly visible culture. 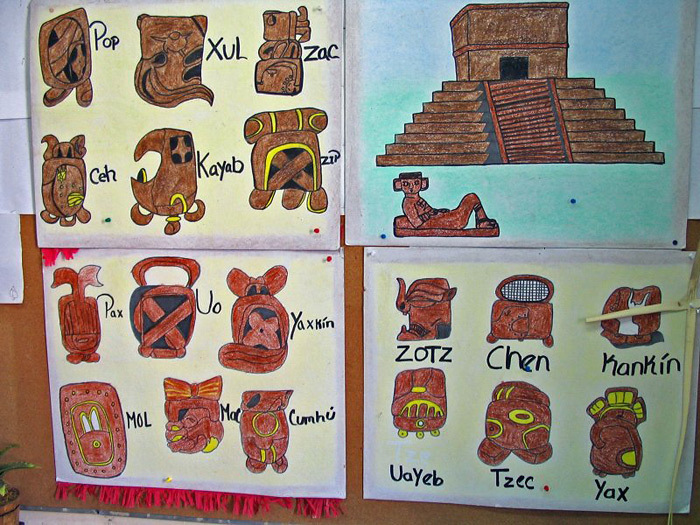 Many, even most, of the places still bear their Mayan names. 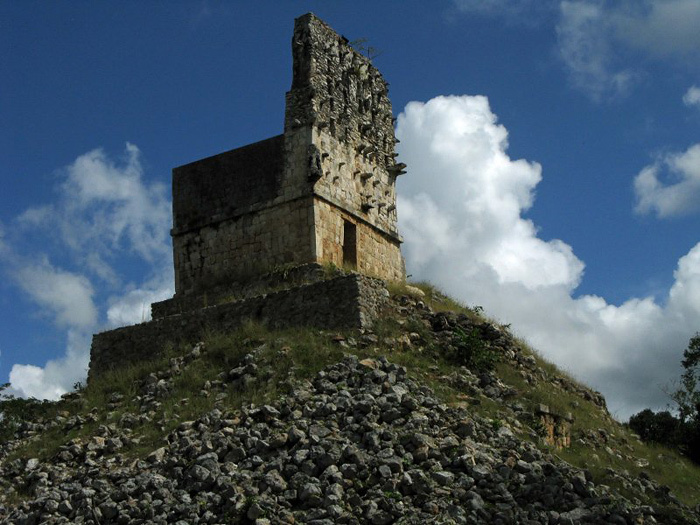 It seems impossibly contradictory that the Mayan cities were abandoned and yet the culture remains. That is what one experiences in these places. There is a sort of mental disconnect; how to understand that these builders of mighty cities have transitioned and yet are same as the people living today? Walking in Merida one day, wandering into a neighborhood, I was attracted by a very old looking church there. Opposite it was a Mayan language school. Seeing the poster at the entrance to the school was as a Eureka! to me. 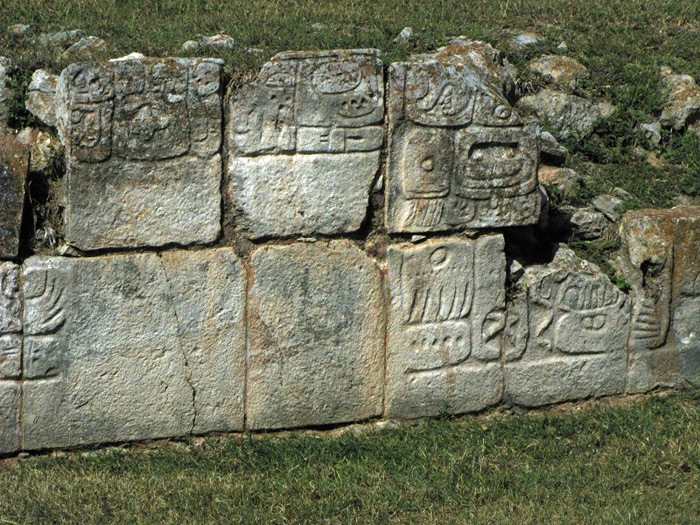 There it was, a connection between the mysterious ancient Maya and the largely colonial Spanish city of today, and the young students learning to read the glyphs that they may translate the old symbols into a spoken language, themselves the concrete sign that the Mayan culture remains vibrant today, their heritage a direct connection to the the pyramids. Steve Wing is a visual artist and writer whose work reflects his appreciation for the extraordinary elements in ordinary days and places. He lives in Florida, where he works at an academic institution. A regular contributor to BluePrintReview and qarrtsiluni, his images also have appared in Cha, Lantern Review, Melusine, and Counterexample Poetics.